Increasingly, teachers are being asked to work with growing numbers of multilingual and multicultural students in their classrooms. This condition requires that teachers have the ability to operate in a globalized space where exchanges are plurilingual and pluricultural (Kramsch, 2008). 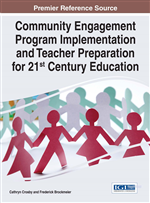 Community engagement provides teachers an opportunity to gain the knowledge and skills they need to operate in a globalize space, and, at the same time, engage, in their local communities, and in the global communities represented in their classrooms. To better help teachers successfully work in globalized spaces, a community engagement project was implemented in an online Teaching English to Speakers of Other Languages (TESOL) course for graduate students in the TESOL Program at a large public research university in Ohio. The two-fold purpose of the study was: 1) To prepare teachers to be successful in a global society by gaining experience working with multilingual and multicultural learners; 2) To provide teachers the opportunity to apply TESOL theory and methods when working with these learners. Using Lave and Wenger’s (1991) theory of communities of practice as a theoretical foundation, the chapter author created a learning and teaching community in an online TESOL course with the incorporation of the following tasks: 1) threaded group discussions focused on theory and methods of teaching TESOL; 2) group writing assignments; 3) self and peer responses to writing assignments; and 4) a community engagement project. A discussion of the community engagement project and its benefits for teachers in globalized spaces is the focus of the following sections.